Shop our Necklace & Chain Boxes collection and present your jewelry in style! 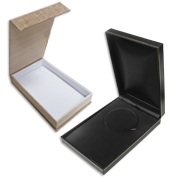 Find quality pieces made of velvet, suede, rosewood, leatherette & cardboard, with ribbons or magnetic closure, sets & 2 doors combination cases. Quality items available in many colors, such as black, white, brown, gold & silver. Get the best deals thanks to our wholesale discounts!